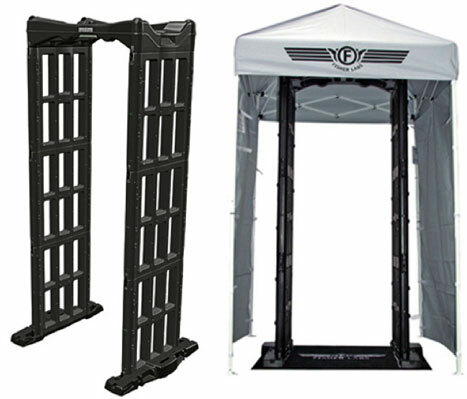 The M-Scope is the world's most versatile walk-through metal detector. When we say portable we mean a truly dynamic platform capable of being rapidly deployed with in minutes instead of hours. With only one operator the M-Scope can be deployed and transported to virtually any location and be up and running within five minutes! With a battery life of 40 hours, a total weight of less than 100 pounds, and a unique one-person tote configuration when collapsed, the M-Scope will empower you with truly dynamic security solutions. The M-Scope is remarkably user-friendly and simple to operate. We have reduced training time requirements while boosting "split cognition"- that is creating a system so simple to use and reliable that operators are freed up to monitor the activity around them- performing vital crowd-scanning functions instead of having their attention monopolized by running the metal detector unit. The M-Scope's digital I/O, secured access control panel has been designed for intuitive ease-of-use and has a built-in self-diagnostic function that will notify operators immediately if there is a situation requiring attention. The M-Scope portable walk-through metal detector features 100 sensitivity settings- giving users an unprecedented array of responsive and variable security magnetometer options! If security is your responsibility- If you're the one who has to explain why.